Meet the Players! 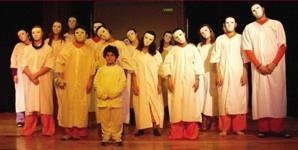 MASKS OFF | Beresheet LaShalom Rainbow Theatre Project. Teatro Arcobaleno • Rainbow Theatre has many players. . .
Far more than meets the eye! ON STAGE | The foremost protagonists of the "Beresheet LaShalom Community Theatre Group" are girls and boys of all backgrounds and denominations, without exception, from the many communities in the Galilee. 13 to 21 year olds from towns and villages, kibbutzim and moshavim; they are Arabs and Jews, Druze and Circassians, religious and secular. Together with their pedagogic teacher, Edna Angelica Calò Livné, these youngsters have gone through a prolonged and intensive program to strengthen the group and develop creativity. Their performances are a dance of hope for freedom. They were created by the group at weekly meetings over the course of a year. In a difficult period of the history of the world there was the will to create a positive message, capable of inspiring hope and fulfilling the dreams of those who know war, and now deeply aspire to peace. Their first production "Beresheet - In the beginning" was created by members of this group, and is the result of their getting to know each other. It is a dream fantasy, the dance of hope for freedom, created at their weekly meetings during the course of a year. There were moments of suffering and conflict - moments when it seemed that there is no safe place in the land of Israel for any of its residents from all the many different cultures. Yet, there was the will to create a positive message, capable of inspiring hope. This led to the creation of a play that incorporates the pain, the dream and also the sincere longing for reconciliation and harmony. Meetings within the framework of the theatre encouraged these youngster from different backgrounds to renew interaction among themselves, enabling them to discover the treasures hidden deep in the soul of each of us. Such discoveries teach us to like ourselves better, to love the people around us - to the point where we can become important elements in the positive effort to change and improve the world in which we live by beginning with ourselves and rippling out to others. "Our performance Beresheet is a Hymn for peace. I can't accept terrorism, I'm glad that I can show, through our performance that coexistence between Jews and Arabs is possible. And we show this with our living presence!" Abir Hleihel, 18, Muslim from the village Jish. "In all our differences, in this theatre I feel that we are all equal. It's not important in which God we believe, or where we live because we are all human beings. The strong connection between us is convincing me more and more of the fact that many in the world should understand: it's possible that a Christian and a Jew can walk hand in hand, that religious and secular can speak without offending each other and that all creatures can live peacefully together." "I felt a voice inside me that said: It's time to change! To go to another direction! And I understood how the difference between us is something so special ! I took off my mask. . . If I could, everyone can! " BACK STAGE and behind the scenes at all times their teacher, mentor and Italian Mamma, Edna Angelica Calò Livné, the inspirational founder and Artistic Director of the Teatro Arcobaleno•Rainbow Community Theatre Group. An experienced educator and dedicated theatrical director, she is a mother of four boys. Born in Rome, Angelica came to Israel when she was twenty, and passionately believes that art and the theatre can be a moving force for people who believe in human principles of goodness and wish to present a positive influence within the society in which they live. Our rock and coach, Yehuda Calò Livné co-founder of the Beresheet LaShalom Foundation, is an executive producer for the Theatre Project. Thanks to his temperate background work coaching these youngsters year-round in multiple activities, the solidity of our group has co-eased into a healthy, vibrant & enthusiastic, devoted company of youngsters. Amir Yaakoby, musical mentor and maestro. 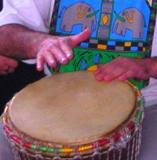 . .
musician, expert in all percussion instruments. After an intense experience of Tribal Dance in Africa he returned to Israel where he composes music inspired by these acquired skills. He presents workshops on Tribal Dance and organic Trance where participants are able to express their feelings through body rhythms and movement. BEHIND THE SCENES are the PeaceWeavers, a unique and meaningful liaison of the many friends of Beresheet LaShalom. As colourful and diverse as our young troupe they include educational bodies, entrepreneurs, educators, artists and promoters, all committed to educating to dialogue for the creation and development of a culture of peace and security. founder of the Lazarus Home for Girls in Bethany, Palestinian Authority, Samar inspired the Bread for Peace Day initiative and has lectured abroad with Angelica. Together, they were awarded the Asissi Peace Prize for their efforts through uniting women. conducter of Radio Kol HaGalil, on-air with us transmitting our weekly radio program Shalom Lecha Salaam. Integrated Communication & Media Relations specialist collaborates, on a personal basis, with the Beresheet LaShalom Foundation in the role of media networking and external relations to promote our projects of Multicultural Education to Peace, in Europe and abroad. "What is as important as knowledge?" asked the mind. . .
"Caring and seeing with the heart" answered the soul. . . .
there is a crack in everything, that's how the light gets in. . ."
faculty of Formation Sciences, University of Florence. Dr. Ivana Tripodi, Department of Education Alessandria. Lionella Quer – professor of mathematics - Castelfranco Veneto. Peace and Human Rights delegate. Carlotta Morgana - Journalist - Il Giorno. Giuseppe Ficca, Torino | formation and co-ordination of cultural projects. Franco Calò, coordinator of cultural projects, Rome. Haim Gunner, among the founders of Sasa and now Emeritus Professor @ the University of Massachusetts, Amherst. Marilyn Silin, Psychotherapist, Illinois, USA. just to mention a few. . .
2008 Takunda Prize for the best solidarity project assigned to Angelica Calò Livné and her Palestinian friend Samar Sahhar. 2008 special mention - Grinzane Carical Prize in Cosenza, Italy. 2007 "Mamma Lucia to Courageous Women" International Award at Cava de Tirreni to Angelica Calò Livné and her Palestinian friend Maysa Baransi Seniora. 2007 Distinction of the Order of Merit of Italian Solidarity conferred with the title Knight by Sandro De Bernardin, Italian Ambassador to Israel, for educational activity and the link created between Italy and Israel. (together with 1000 other women from around the world). 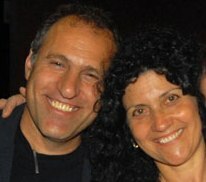 2006 Carthage International Human Rights Award, at Trani, to Angelica and her husband Yehuda who collaborates in all the educational activities. 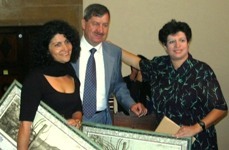 2005 Saharov Prize nominees, Angelica and Samar. at the Sacred Convent of Assisi. 2003 International Award "Women who Educate to Peace"
"Education at all levels is one of the principal means to build a culture of peace."